The Grunidg G2000A Porsche Design is a stunning AM, FM, shortwave radio designed by F.A. Porsche of Germany. Shortwave tunes from 2.3-7.4 and 9.4-26.1 MHz via Up/Down buttons, auto search, direct keypad entry or via 20 memories (5 for MW, 5 for FM, 5 for SW1 and 5 for SW2). Tuning the world couldn't be simpler. The digital quartz clock, with sleep timer, wakes you to a beep or to the radio. Features include: lock button, 9/10 kHz medium wave step and stereo/mono switch. The left side of the radio has the earphone output jack and the 4.5 VDC power input jack. The top of the radio has the Volume control band band switch. The G2000A features a gorgeous real leather, snap-on case, stereo earbuds and Grundig Shortwave Guide. Only 5.5 x 3.3 x 1.3 inches 11.5 oz. (140x90x33mm 326 g). The G2000A requires three AA cells or Grundig G2ACA AC power adapter (both optional). 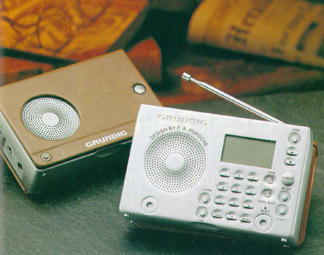 The G2000B is the same radio, but with Black leather case. Click here to view. Copyright 1998-2016 Universal Radio, Inc.